Your wedding reception is easy to customize and decorate but adding in personal touches and customizations to your ceremony can be a lot harder. We recently worked with a couple who was looking for something unique to add to their wedding ceremony apart from the typical unity candle or sand pouring, so we began doing some research into different rituals, traditions and even modern ideas. One small wedding (28 guests) we worked with had a small tree to plant at their wedding ceremony and they gave all of the guests tiny bottles of water to help them water the tree after planting it. Afterwards, they planned to bring the tree home and plan it in their home garden. Note: this idea can work with a smaller plant too if you don't have room for a tree. 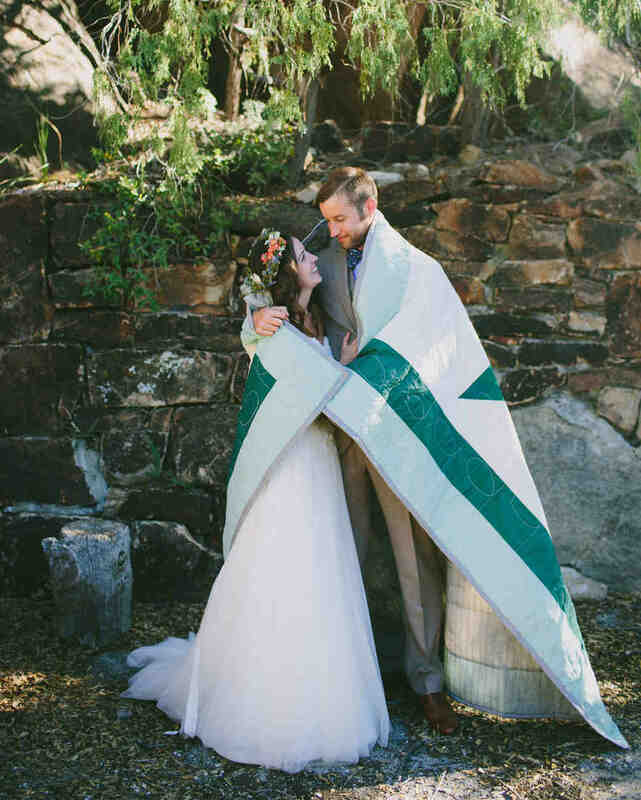 This is a beautiful ritual derived from Native American culture in which a quilt is wrapped around the newlyweds’ shoulders to symbolize warmth and togetherness as they take on the future. Our favourite part of this ritual is the bonus of having a beautiful quilt created for you that can be set on your bed afterwards and even passed down to your children or grandchildren. Note: The original Cherokee tradition is a bit more elaborate. Firstly, both parties are individually wrapped in blue blankets. Then the couple is wrapped in a single white blanket and the union is blessed. The blue represents elements of the couple’s respective past lives and the white symbolize’s the couple’s dedication to filling their marriage and new lives with peace. The sundial ceremony is a Celtic ritual in which couples touch fingers through the hole of a sundial to confirm their union. Next, the couple passes a silk scarf through the hole of the sundial three times as they make a wish. Finally, guests are invited to make their own wish for the couple as well. This is a beautiful African tradition which represents the union of two homes by combining fire from each families respective hearth. Today this custom is often modified so the newlyweds simply start a fire together (a great idea is to invite your parents to kindle the flame). In this ritual a rope is passed from guest to guest throughout the ceremony which symbolizes their commitment to support this marriage. After the last guest has held the rope, it is returned to the couple who braid it together (the braid symbolizes their union to each other, and if religious, to God). Another Celtic practice you can incorporate into your own ceremony is handfasting. In this ritual, the bride and groom hold opposite hands (to make a figure eight symbolizing eternity). Next, their hands are tied with ribbon or rope to symbolize their union. You could even use an heirloom piece of fabric or something special to your family. Another favourite ceremony or ritual is the lasso ceremony (from Mexican, Filipino and Spanish cultures). During the wedding ceremony the couple is draped in a floral garland or rosary in the form of a figure eight (symbolizing eternity and unity). The garland remains on the couple for the remainder of the wedding ceremony and at the end of the wedding is saved as a reminder of their vows. 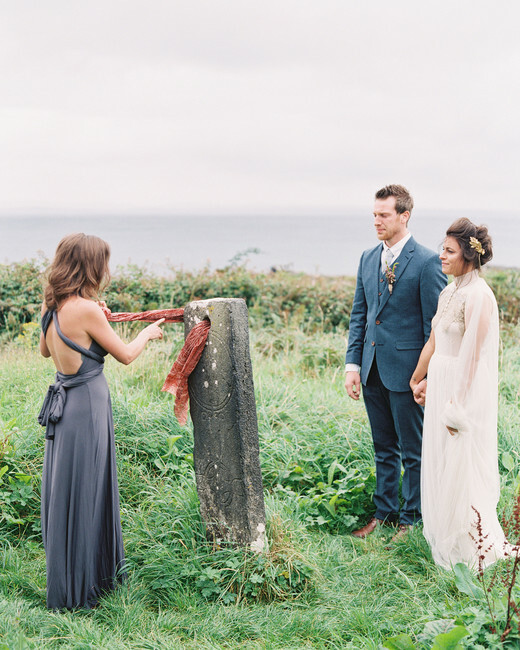 This modern ceremony is a lot of fun and a great addition to a wedding ceremony. Before the ceremony, fill a box with special and meaningful items to your marriage (love letters, poems, a favourite bottle of wine, notes from guests etc.) and then hammer it shut during your wedding ceremony. You can then open the box on your first anniversary (or a later anniversary if you have the patience). Send your wedding bands down the aisle and give each of your guests a chance to hold them and bless them or release positive thoughts over them throughout the wedding ceremony. Wine is a common element in many religious ceremonies but there are several variations for weddings. We like the idea of having two small carafes of wine and after exchanging rings each person respectively pours a carafe of wine together into a third carafe, creating a blend. Afterwards, the newlyweds each take a sip of the blended wine to represent their individual lives becoming one. If you'd like more ideas or information about how we can help design and coordinate your Banff, Canmore or Lake Louise wedding be sure to get in touch today.